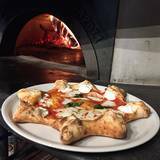 Open seven days a week for lunch and dinner, Amalfi Pizza is a traditional Neapolitan pizzeria centered around two 6000 pound wood-burning brick ovens imported from Italy. The 170 seat dining room also has large semicircular booths, custom wrought iron chandeliers along with Juliet balconies overlooking an Italian-inspired entryway. Co-founder and operating partner Greg Grant worked in the kitchen to develop our authentic Italian menu that includes Neapolitan-style pizzas as well as appetizers, salads, pasta dishes and original desserts from Dailey’s recipes. Book your private event or party at Red Phone Booth or Amalfi Pizza in the over 12,000 sq. ft. iconic Dailey's downtown location. If you’d prefer to talk now, please call us at (888) 605-4838.